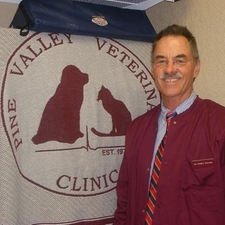 Dr. Bruns has been a member of the Pine Valley Veterinary Team since 1999. In 2012, she joined Dr. Graham to become part owner of the practice. She then assumed full ownership of the clinic in 2014 after Dr. Graham's passing. 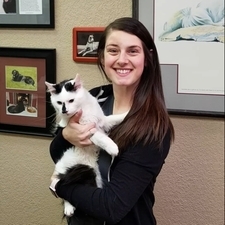 She enjoys establishing relationships with clients so that they can actively participate in the decision making process regarding the health of their pets. 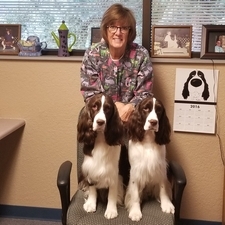 During her career as a veterinarian, she has developed a special interest in managing cancer patients. Dr. Bruns enjoys a busy lifestyle balancing her career and family, which consists of her husband, Mark, and their 4 children, Alex, Andy, Ethan, and Emily. In her free time, she likes to go running with her dog, Daisy, who must also share the limelight with Gully, an English Springer Spaniel, and 4 cats, Henry, Gordy, Dru, and Zelda. 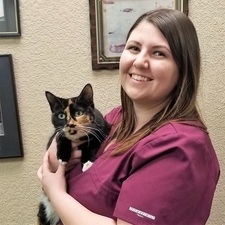 A native of Fort Wayne, Dr. Schenkel has been working as a small animal veterinarian in the area since graduation and has a special interest in small animal wellness/preventative medicine, feline medicine, and small animal dentistry. 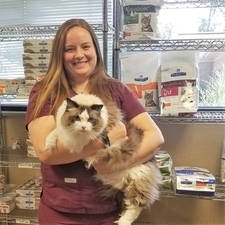 She is a current member of the American Association of Feline Practitioners (AAFP) and helped Pine Valley Veterinary Clinic to achieve its Cat Friendly Practice Certification in 2013. Dr. Schenkel and her husband, Brent, have two children, Gracie and Jonathan. They share their home with German Shepherd, Alexis, and three cats; Prince Ali, Frankie and Brucie. During her free time, Dr. Schenkel enjoys spending time with her family, reading, and relaxing at the lake. We welcomed Dr. Pat Funnell to the PVVC team in January of 2016, after many years of experience in Fort Wayne. 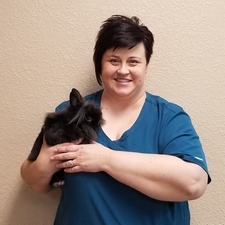 She adds an exotic component to our animal care, as she enjoys seeing any pets from dogs and cats to birds, reptiles, sugar gliders, ferrets, guinea pigs....and almost anything else! 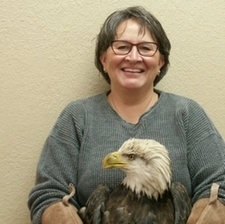 She is a member of the Association of Avian Veterinarians. Dr. Funnell and her husband, Byron, are both Fort Wayne natives. They have one black lab, Ink, as well as horses, chickens, and goats. 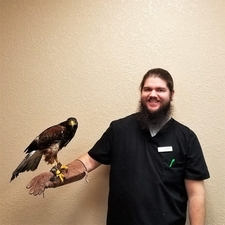 Dr. Funnell works extensively with Soarin' Hawk Raptor Rehab in Fort Wayne. In her spare time, Dr. Funnell also enjoys helping tutor Burmese children, volunteering at Dove's Nest, and being active in her church. It is with a heavy heart that we announce the passing of Dr. M. Dennis Graham Thursday, September 11, 2014. A graduate of Purdue University's School of Veterinary Medicine, Dr. Graham opened the doors of Pine Valley Veterinary Clinic in 1979. Prior to this, Dr. Graham proudly served in the USAF Veterinary Corps and practiced in St. Louis, Missouri and Rochester, New York prior to making his permanent home in Fort Wayne. Dr. Graham always had an intense love for his profession and his patients. He practiced mainly in the areas of small animal general medicine and surgery, although he developed a strong love for and a professional interest in canine and feline cardiology. Dr. Graham was a self-proclaimed "hosta-holic," as he dearly loved his garden at home with as many of these shade perennials as his yard would hold! He also enjoyed the scenery at his house, as he was the proud owner of many Koi and other goldfish varieties that reside in his Koi pond. He was also an avid lover of all things Purdue University. Dr. Graham attended many Purdue basketball and football games. Dr. Graham leaves behind 4 children: 2 sons (Shaun and Brooke) and 2 daughters (Erika and Cotter). He and his wife, Abby, shared their home with their 2 dogs, Linnhe and Romeo. Dr. Graham will certainly be missed by all who knew him. Mary has been with the Pine Valley Veterinary Clinic since the clinic opened in July of 1979. Mary chooses to work in a "part-time" capacity most of the time. A "road warrior," Mary travels thousands of miles a year to attend dog shows to exhibit her English Springer Spaniels. Her success in the ring has included competing several times in the Westminster Dog Show. Mary is an active member of the English Springer Spaniel Field Trial Association, and the Northestern Indiana Kennel Club. She is an invaluable source of information on how to locate reputable breeders for purebred dogs. Most recently, Mary has been showing her young dogs, Tracea, Olive and Giggles in Conformation as well as training in Agility and basic Obedience. 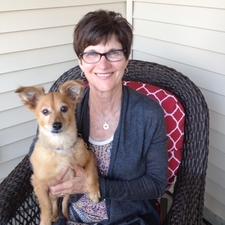 Ann has made a career of veterinary medicine and has been an invaluable part of PVVC since January of 1990. She spent many years assisting in exam rooms and helping out in the back. While she can still be found doing these things from time to time, she can primarily be found in her office, hard at work as Pine Valley's Business Manager. Ann and husband, Bay, have 3 cats, Decon, Damon, and Deion, and a black and white English Springer Spaniel, Devon. She also has a little black mouse, Trey, who resides in his condo in her office. Ann offers in-home pet sitting as a side practice, offering caring, compassionate care for your pets in your home! Amy became part of the Pine Valley team in July 2008. She attended Purdue University, graduating in 1995 and has been practicing ever since. She later went back to school and graduated in 2004 with a Bachelors in Applied Science in Business Management degree. Amy wears many "hats" at Pine Valley. She is our Practice Manager, handling all aspects of human resources. 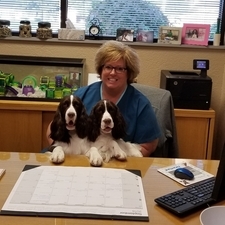 As an RVT, she is also responsible for patient care as well as assisting the doctors in exam rooms and in surgery. She is also our clinic's OSHA Safety Manager, ensuring that our staff, clients, and patients are safe from hazards. Amy stays active in the veterinary medicine community. She is a past president of the NEIVMA Veterinary Techinician Division, a past district representative for the IVTA, and is currently spearheading a local NEIVMA Management group. 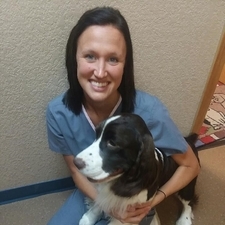 She is actively working towards a management specialty as an RVT. Amy has a full house when she is not at the clinic. She shares her home with her husband, Kyle, and two daughters Morgan, who is expecting her first child, and Taylor. Her family also includes her 4 legged children with her dogs Scrappy, Boomer, Dave and Url, and her cats Ocho, Dhyllyn, Dottie and Joe. She also has a winged child, her cockatiel, "D". In her free time, Amy enjoys singing in her band, reading, and spending time with family and friends. Kristina became a member of the Pine Valley team in November of 2013. She and her husband, Josh, share their home with her dogs, Lacey and Marley, and cat, Lola. They also have a son, Jaxson, and a daughter Brianna. Prior to coming to Pine Valley, she worked at Fort Wayne Animal Care & Control for 7 1/2 years as an adoption counselor. This makes her a wonderful contact for anyone looking for a new furry addition and for advice on intergating new furry friend into your home. In her spare time, she enjoys hiking and camping with her husband and kids. Liv primarily works in the customer service aspect of the clinic- scheduling appointments, answering questions over the phone, etc. 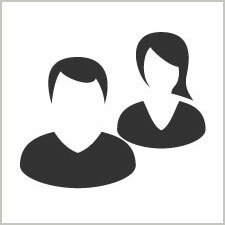 In addition she handles creating and updating client accounts and records, as well as checking patients in and out. Liv married her high school sweetheart, Rob, September 6, 2014. While they do not have children at this time, they have a number of furry family members. They fill their home and their hearts with two cats, Brick and Sid, and their (always entertaining) Airedale Terrier, Alfred aka Alf or Alfie. When Liv is away from the clinic she loves cooking (and eating) new foods and recipes, often bringing in recipes to share. She and her husband enjoy a number of outdoor activities including biking. Together they have completed a number of road bike races. She is also enjoys shopping for deals, and decorating her home with a number of refurbished antiques. Olivia enjoys cooking and baking during her time away from Pine Valley! She keeps us well-fed! 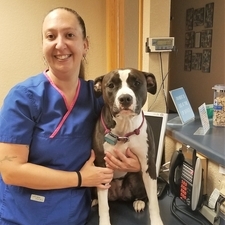 Rita has a background in pharmaceutical sales, but due to her love of animals made a transition to the veterinary field and has worked in the front end for 13 years. She retired in December 2015 and it lasted 10 weeks! She missed the interactions with the clients and their pets. 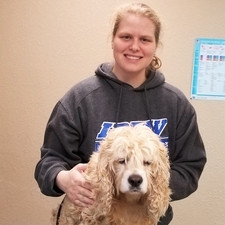 She feels fortunate to have had the opportunity to re-enter the field part-time at Pine Valley Veterinary Clinic in March 2016. Rita shares her home with her husband, Mike, and their dog, Max. She has two grown sons and two grandsons. Rita enjoys spending time with her family, reading, and doing yoga. She manages to keep herself very busy in her semi-retired state. 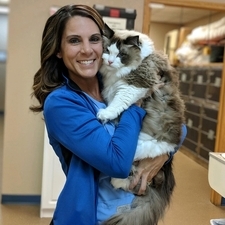 Jenna started in 2003 as a high school intern, and continued as a Veterinary Assistant/Receptionist for several years. The ever changing computer system has made her our in-house IT department. She eventually took on our diet inventory management and is very knowledgeable about the veterinary diets that we carry. As changes in technology has progressed, the IT part of her job has become more prominent, adding in Social Media and website management to her job. She married Nick in January of 2009. They only have four-legged children in their home: 2 cats, Morgana and Anubis, and 3 dogs, Loki and Flytish the rescue Pit Bulls, and Freyja, an American Staffordshire Terrier. They enjoy a number of family, outdoor activities with their dogs including: Jeeping, canoeing, camping, hiking, and running, having completed a number of 5Ks with and without the dogs as running partners. In recent years she has begun training in different canine sports with Flytish and now Freyja. They train and compete in AKC Obedience, Rally, Agility, and Conformation. Jamie joined the Pine Valley team in June of 2010. 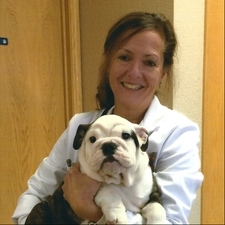 She has worked in several different types of clinics, including a feline specialty clinic. Her family includes a cat named Donatello (named after the Ninja Turtle, of course), a Lab Mix named Leonard, a Border Collie named Kera, and Steve, the Bearded Dragon. Jamie's special areas of interest are dentistry and anesthesia. She enjoys spending time with her husband and 2 children. She enjoys outdoor activities including: fishing, camping, hiking, and walking the dogs. Tiffany joined the Pine Valley team in January 2013, and married her high school sweetheart, Josh, in June 2013. Their daughter Brielle was born September 2017. Her four-legged children include Leilah, a beagle mix, and her cats Snickers, Maxie, Randall, and Bernard. Tiffany loves watching NFL football, and is a dedicated Green Bay Packers fan. "Go, Pack, Go!" Allayna joined the PVVC team as an extern from Brown Mackie College in July of 2015. We liked her so much that we decided to keep her, and she was hired on full-time in September of 2015. She then graduated from Brown Mackie and took her national board exam to become a Registered Veterinary Technician in December of 2015. Prior to coming to Pine Valley, Allayna has worked in pet stores and grooming salons. Allayna lives with her husband, Taylor, and their son, Elias. They are currently expecting their second son...coming soon! She also shares her home with their three dogs Zeke, Leila, and Samson, and her cockatiel, Cleo. Stephanie joined the Pine Valley team in December of 2016 as a Registered Veterianry Technologist. She graduated from Purdue University with a BS degree in Veterinary Technology and has been working as a small animal RVT since. Stephanie married her high school sweetheart in September 2016. She shares her home with her husband, Ethan. They currently don't have any pets, but plan to in the future. In her free time she enjoys baking (especially home-made bread) and spending time with her family and friends. Ashley attended Purdue University where she received a Bachelor's in Animal Science and an Associates in Veterinary Technology. She then moved to Indianapolis where she worked as a RVT for 8 years. 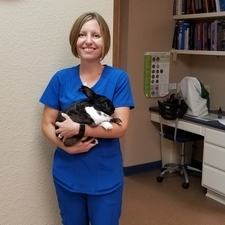 She then returned to Fort Wayne and began working at the Pine Valley Veterinary Clinic in May of 2017. 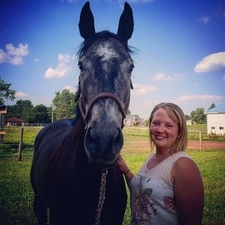 Ashley's combined love of animals and science lead her to working in Veterinary Medicine. 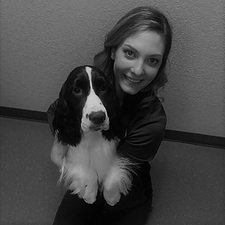 As a valued member of our team, Ashley's duties include: collecting and running lab samples, monitoring animals under anesthesia, caring for hospitalized patients, assisting the veterinarians, taking radiographs, and client education, to name a few. Ashley shares her home with her cat, Tickle. When she is not in our office, she enjoys a variety of outdoor adventures, reading, watching movies, and being crafty. Justine moved to Fort Wayne in September 2018 and joined the PVVC team November 2018! 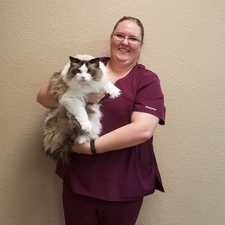 She started to work in the veterinary field in 2014 as a Veterinary Assistant and graduated Brown Mackie College in 2015 with an Associates Degree in Veterinary Technology. Currently she is working towards passing her boards to become a Registered Veterinary Technician. In her free time she is an avid board gamer, enjoys hiking and camping with her husband, Tim, whom she married March of 2018. She is also heavily involved in her church and enjoys singing. Justine has 6 pets. Five cats named; Butterfinger, Spencie, Luna, Eevee and Tortellini. She also has a pitbull named Greyson who she takes every other Sunday to an assisted living home to visit with the elderly patients. Justine is excited to be a team member of the PVVC and enjoys caring for all of the patients she meets. Erin was with Pine Valley from 2007 until 2013, when she took a brief break from small animal medicine to work excusively with horses. She missed Pine Valley and smaller critters, so she returned to us in 2015. 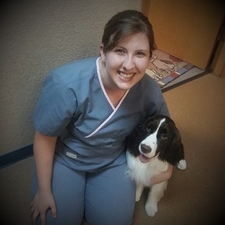 Erin is a Veterinary Assistant, assisting Dr. Schenkel with her clients and patients. She has become a fixture in our exam rooms! Erin is an avid equestrian. She owns one horse, Tito, and they do Hunt Seat riding and jumping. She also teaches English riding lessons at a local stable. Erin shares her home with her dog, Sampson. In her free time she enjoys horseback riding, spending time with family and friends and, playing with Sampson. Logan was our high school intern from DeKalb High School beginning September of 2009, and has been with us ever since. He is now an assistant and helps the doctors and technicians immensely. He can most commonly be found working with Dr. Funnell, assisting with birds and other exotics. He is trying to observe all that he can at Pine Valley during his tenure here. Logan's kindness and compassion calm even the most nervous pets. He can frequently be found spending his lunch break assisting Dr. Funnel with the raptors from Soarin' Hawk. Logan began classes at IPFW in August 2010 to pursue a career in Veterinary Medicine as a veterinarian. Logan loves all kinds of music. He also works part-time as a DJ with one of his friends! He shares his home with his son, Kaiden, cats, Meep and Biscuit, as well as a Chinchilla named Ember. Kayla moved to Fort Wayne at age 9 where she graduated from Snider High School. She then attended IPFW and Purdue University, graduating with a Bachelor's in Biology. Kayla has a big heart for animals and hopes to continue on to veterinary school to pursue a career helping animals and pet parents.. It is Kayla's responsibility to assist the doctors and technicians during various procedures and appointments, making sure they have what they need, when they need it. 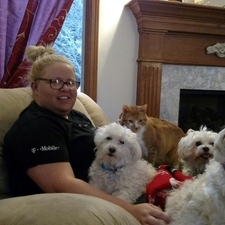 Kayla shares her home with a variety of fur (and not fur) babies including her 5 cats; Scooby, Chloe, Princess, Ali and Madeline, and 2 turtles. She is frequently known to have a litter of foster kittens she is caring for until the are old enough to go to their fur-ever homes. When Kayla is not in our clinic she enjoys drawing, reading and gardening. Despite the fact that she works 3 jobs, she always manages to make time for all of her hobbies and animals. Melissa has been a part of Pine Valley's team since 2008, originally in a full-time capacity as a Registered Veterinary Technician. While Melissa has chosen to be a stay-at-home mom, she will still be here from time to time as a relief technician or receptionist when we need her. Melissa and her husband, Chris, have two dogs, one cat, and two daughters, Reagan and Kaelyn. She enjoys spending time with family and hanging out at the lake. Chelsea started as a high school intern in 2010. After graduation, she became a permanent member of the Pine Valley family as a Veterinary Assistant. She graduated from college in 2014 as a Radiologic Technologist. She has been able to incorporate her degree in radiology into her work at PVVC. Chelsea has trained in restraint, reception, and many other areas of the hospital. She loves animals and wants to take them all home! Although Chelsea is very part-time at Pine Valley, she loves working with our clients and patients. Chelsea and her husband, Jaron, share their home with their Maltese, Hemi, and Corgi Mix, Rue.